3:42 PM CDT Quarter sized hail reported near Dixon, MO, 42.9 miles NW of Salem, MO, lots of nickel to quarter hail near hancock. 3:50 PM CDT Half Dollar sized hail reported near Dixon, MO, 39.3 miles NW of Salem, MO, half dollar sized hail north and east side of dixon. 4:15 PM CDT Quarter sized hail reported near Cuba, MO, 28.3 miles NNE of Salem, MO, hail up to the size of quarters. 4:22 PM CDT Quarter sized hail reported near Sullivan, MO, 45.5 miles NNE of Salem, MO, via facebook report with picture. 4:30 PM CDT Quarter sized hail reported near Rolla, MO, 27.2 miles NNW of Salem, MO, delayed report of quarter size hail reported between rolla and st. james. 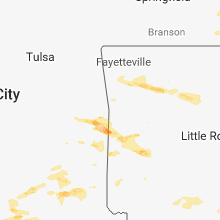 time estimated from radar. 4:48 PM CDT Quarter sized hail reported near Saint James, MO, 25.4 miles N of Salem, MO, relayed report from public. 4:57 PM CDT Quarter sized hail reported near Plato, MO, 38.7 miles WSW of Salem, MO, social media. 5:02 PM CDT Tennis Ball sized hail reported near Plato, MO, 34.1 miles WSW of Salem, MO, public report relayed by media partner. 5:02 PM CDT Golf Ball sized hail reported near Plato, MO, 34.1 miles WSW of Salem, MO, report from fire dept. relayed by media partner. 5:02 PM CDT Hen Egg sized hail reported near Success, MO, 35.1 miles WSW of Salem, MO, relayed from public. 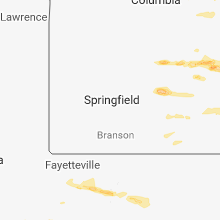 5:03 PM CDT Quarter sized hail reported near Grovespring, MO, 40.3 miles ENE of Springfield, MO, report of quarter sized hail near hwy 5 and route h.
5:17 PM CDT Quarter sized hail reported near Grovespring, MO, 43.1 miles ENE of Springfield, MO, report of quarter sized hail east of grovespring... mo. 5:22 PM CDT Quarter sized hail reported near Steelville, MO, 25.8 miles NNE of Salem, MO, from facebook post with picture. time estimated. 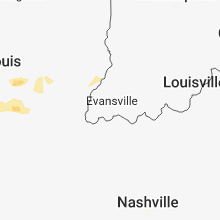 5:25 PM CDT Golf Ball sized hail reported near Blackwell, MO, 46.8 miles SW of Saint Louis, MO, mping report. 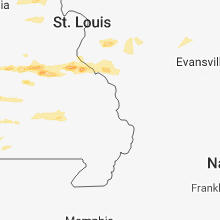 5:35 PM CDT Golf Ball sized hail reported near De Soto, MO, 47 miles SSW of Saint Louis, MO, late report. 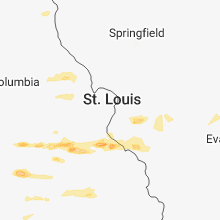 6:01 PM CDT Half Dollar sized hail reported near French Village, MO, 46.2 miles S of Saint Louis, MO, corrects time of previous hail report from 2 ese french village. 6:21 PM CDT Quarter sized hail reported near Willow Springs, MO, 40.9 miles SSW of Salem, MO, report via social media. 6:23 PM CDT Ping Pong Ball sized hail reported near Potosi, MO, 46.3 miles ENE of Salem, MO, report via facebook with picture. 6:30 PM CDT Golf Ball sized hail reported near Warrenton, MO, 58.3 miles WNW of Saint Louis, MO, near truxton... mo. 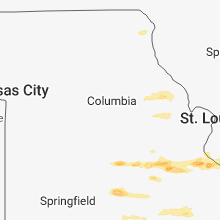 6:32 PM CDT Quarter sized hail reported near Warrenton, MO, 55.7 miles WNW of Saint Louis, MO, twitter and snapchat videos of hail covering i-70 west of warrenton. at least one inch stones seen on camera. 6:41 PM CDT Quarter sized hail reported near Salem, MO, 12.5 miles NE of Salem, MO, report via social media. 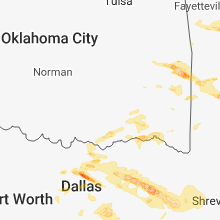 5:30 PM CDT Quarter sized hail reported near Stigler, OK, 41.5 miles WSW of Fort Smith, AR, size estimated from a photo relayed via broadcast media twitter account. 6:10 PM CDT Golf Ball sized hail reported near Bokoshe, OK, 24.8 miles WSW of Fort Smith, AR, relayed via facebook. 6:30 PM CDT Golf Ball sized hail reported near Poteau, OK, 28.5 miles SSW of Fort Smith, AR, reported on highway 71 between poteau and wister. 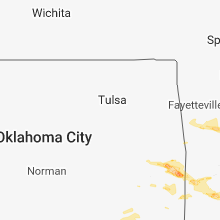 6:35 PM CDT Golf Ball sized hail reported near Poteau, OK, 25.7 miles SSW of Fort Smith, AR, nickel to golf ball hail almost covering the ground in downtown poteau. 6:45 PM CDT Baseball sized hail reported near Howe, OK, 32.4 miles SSW of Fort Smith, AR, photo of hail posed with a baseball relayed by broadcast media via twitter. 7:00 PM CDT Quarter sized hail reported near Smithville, OK, 58.4 miles NW of Nashville, AR, quarter size hail reported at mountain country store. 1:02 AM CDT Quarter sized hail reported near Broken Bow, OK, 55.3 miles W of Nashville, AR, holly creek fire department reports quarter size hail. 1:20 AM CDT Half Dollar sized hail reported near Broken Bow, OK, 51.6 miles W of Nashville, AR, 1/2 dollar size hail in broken bow photo via social media. 1:38 AM CDT Half Dollar sized hail reported near Broken Bow, OK, 51.6 miles W of Nashville, AR, photo sent in social media. 5:59 PM CDT Quarter sized hail reported near Sherman, TX, 56.9 miles NNE of Dallas, TX, quarter sized hail. 10:47 PM CDT Half Dollar sized hail reported near Plano, TX, 19.5 miles NNE of Dallas, TX, hail up to half dollar size at murphy pd. 11:31 PM CDT Quarter sized hail reported near Celeste, TX, 48.9 miles NE of Dallas, TX, quarter size hail in celeste. 12:23 AM CDT Quarter sized hail reported near Brashear, TX, 65.1 miles ENE of Dallas, TX, quarter size hail in brashear. 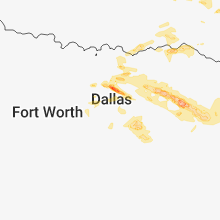 12:35 AM CDT Half Dollar sized hail reported near Fort Worth, TX, 38.7 miles W of Dallas, TX, sw portions of fort worth. 12:50 AM CDT Quarter sized hail reported near Como, TX, 79.6 miles ENE of Dallas, TX, quarter size hail in como. 1:02 AM CDT Hen Egg sized hail reported near Winnsboro, TX, 88.4 miles E of Dallas, TX, golf ball to hen egg size hail in city limits of winnsboro. 1:07 AM CDT Ping Pong Ball sized hail reported near Winnsboro, TX, 88.3 miles E of Dallas, TX, ping pong ball sized hail fell on the south side of winnsboro. report via mping. 1:07 AM CDT Quarter sized hail reported near Winnsboro, TX, 88.4 miles E of Dallas, TX, corrects previous hail report from winnsboro. social media report. 1:20 AM CDT Golf Ball sized hail reported near Winnsboro, TX, 85.7 miles WNW of Shreveport, LA, golfball size hail reported in perryville. 1:45 AM CDT Quarter sized hail reported near Winnsboro, TX, 88.4 miles E of Dallas, TX, social media report. 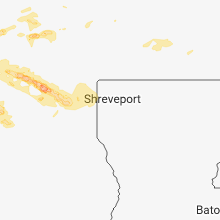 2:25 AM CDT Quarter sized hail reported near Hallsville, TX, 44.1 miles W of Shreveport, LA, quarter size hail fell in nesbitt. 5:45 PM CDT Golf Ball sized hail reported near West Fork, AR, 39.1 miles NNE of Fort Smith, AR, relayed via twitter. vehicle damage noted. 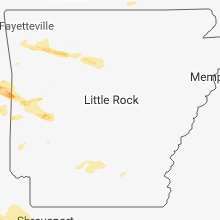 5:45 PM CDT Quarter sized hail reported near West Fork, AR, 39.1 miles NNE of Fort Smith, AR, dime to quarter sized hail reported via twitter in west fork. relayed by broadcast media. 6:00 PM CDT Ping Pong Ball sized hail reported near Fayetteville, AR, 41.8 miles NE of Fort Smith, AR, photo received via twitter through broadcast media account. location is the hazel valley community. 6:10 PM CDT Golf Ball sized hail reported near Elkins, AR, 44.1 miles NE of Fort Smith, AR, relayed via our facebook page. 6:45 PM CDT Golf Ball sized hail reported near Saint Paul, AR, 52.8 miles NE of Fort Smith, AR, one of three hail stones pictured posed next to a dime appeared to be the size of a golf ball with the two others closer to a ping pong ball. 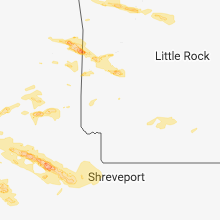 6:45 PM CDT Quarter sized hail reported near Saint Paul, AR, 52.8 miles NE of Fort Smith, AR, hail appeared to be at least a quarter if not bigger from a video relayed on twitter via broadcast media. 9:03 PM CDT Quarter sized hail reported near Pencil Bluff, AR, 47.5 miles N of Nashville, AR, quarter size hail reported in pencil bluff. 9:12 PM CDT Quarter sized hail reported near Oden, AR, 46.4 miles N of Nashville, AR, relayed from local fd. 5:30 PM MDT Quarter sized hail reported near Loma, CO, 16.8 miles NW of Grand Junction, CO, observed mostly dime sized hail with some quarter sized hail.